Elizabeth Spring is a librarian who specializes in local history and genealogy. Her maternal grandparents, Stanislaw Bubnowski (born 1877 in Bialy Kamien, emigrated 1905) and Julia Czosnykowska (born 1878 in Bialy Kamien, emigrated 1907, returned to the village in 1911, then returned to America in 1913) are both on this Hamburg passenger list compilation. For more information on the people on the list, please visit www.ancestry.com. There you will also find the original images of the Hamburg lists. It will be easy to find your ancestor/s if you use the spellings on this list. Also, you may want to search the Ellis Island passenger lists to find out more. Please share any information on individuals who may have come from Bialy Kamien via Hamburg! Elizabeth is researching the following surnames from the Bialy Kamien area: Boniszyn, Bubnowski, Czajkowski, Czosnykowski, Dudkiewicz, Goral, Konasiewicz, Kuczynski, Kurytkiewicz, Schmutz and Wiercinski, and welcomes questions and information about these families. 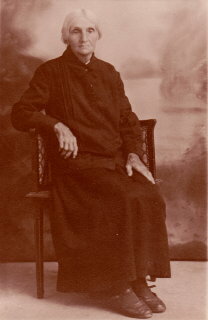 The picture above is of Anna Boniszyn Czosnykowska, Julia Czosnykowska Bubnowska’s mother, who was born in Bialy Kamien on 9 March 1849 and died there sometime around 1941.